This no nonsense camera sacrifices advanced features for fantastic build and quality, in terms of the physical item and the recorded footage. If you are looking for a simple to use and reliable camera, the Icefox dash cam is one to consider, along with it’s main competitor, the Full HD MAISI dash cam. The build quality of this camera feels great, as the camera is surrounded by a metal casing. Not only will this protect the camera from an accident, but also provides a high quality look and feel to the dash cam. The only downside to this is that the camera will appear more attractive to potential thieves, so be sure to hide it away when parking unless you need to use the “motion detection”. The large 3 inch screen displays very clear images, and combined with the easy to use buttons, makes for simple menu navigation. On one side of the camera you will find an on/off button, an “ok”, a mode, and a lock button. On the other side you will find three buttons, up, down, and menu. The lens has a particularly wide aperture at f/2.2, meaning it can allow in more light to produce better quality video. *The wide lens combined with the Wide Dynamic Range is what the manufacturer refers to as night vision. This also helps the camera in lower light conditions, something the majority of dash cams struggle with. 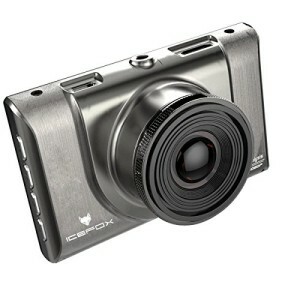 The Icefox dash cam records in standard HD, 1080p at 30 frames per second or 720p at 60 frames per second. Combined with the 170 degree field of view, the entire road will be recorded, as well as cars at the front/side of your vehicle. 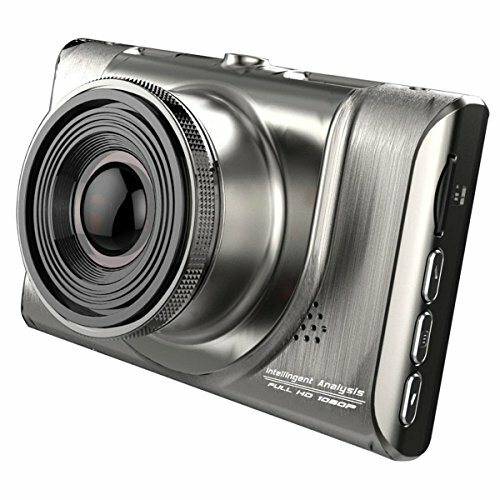 You can use motion detection if you are planning on leaving the camera plugged in while away from your vehicle, but be warned, this shiny finish on this camera will appear particularly valuable to thieves. In this mode, the camera will begin recording when it detects motion. It is also worth noting that battery life can be a problem when leaving the car for a long amount of time, and if your 12v charger is active while the ignition is off, the car battery can be quickly drained. The Icefox dash cam records in loops, so it will continuously overwrite old unprotected recordings rather than stopping when the SD card fills up. To manually protect the current loop, press the lock button while recording. Alternatively, the built-in G-sensor will detect an impact and automatically protect the important files. The loop recording feature is used in the majority of dash cams, and can wear out lower quality SD cards very quickly, as all cards are slightly damaged every time footage is recorded. For this reason, we recommend spending a bit more money on a high quality SD card with a longer lifespan. As with most HD dash cams, you will need at least a Class 10 micro SD card with 32GB maximum, something like the Sandisk Extreme. Make sure to click this link, and purchase from a reputable seller (either Amazon or Sandisk). There is currently a large problem with fake and faulty cards being sold, so if you are having difficulties with the SD card you buy, get in touch with Amazon ASAP, as they have a fantastic returns policy. Using the camera can be 100% hands free, as it will automatically turn on and begin recording when provided with power. The camera will shut down as the ignition is switched off, but we always recommend unplugging the camera to be sure the car battery isn’t drained. The overall video quality is great, particularly in lower light conditions. The High Dynamic Range really helps out with the camera quality, and the wide aperture provides the camera with plenty of light even during the evening. Watch the video further down the page for an example. Although it lacks many of the advanced features such as GPS or WIFI, this camera will give you exactly what you expect for the price. That is, a dash cam that looks fantastic, high quality, and provides great HD video, more than adequate for insurance purposes. Although there is no true night vision, the quality of video in low light conditions is impressive. 4.8/5 – 29 Reviews – The Icefox dash cam is new to the market so hasn’t accumulated a large amount of reviews. Also be warned, the majority of reviewers have received their cameras in exchange for their review. Although reviewers may claim this has no impact on the rating, people will usually be less critical with free items rather than those they have paid for. With this being said, we believe this is a great dash cam for the price.